Q: What does the window cleaning in Dormers Wells consist of? Regular inside window cleaning with ladders and sponges. A: Our service will be carried out by experienced and fully vetted Dormers Wells window cleaners. They'll also don branded uniforms, so you'll easily identify them as soon as they appear near your premises. A: In essence, this is a lengthy pole that shoots water under high water pressure. It allows the experts to reach the fourth floor of any commercial or residential building from the safety of the ground. A: Not at all! The team will utilize a special filtered water container inside their vehicle. However, if the tank is empty, we will happily accept your offer. Q: Are there any demands that I should meet beforehand? A: You have to make sure that there will be a free parking slot within 30 metres from your domain and on the same side of your panes. The professionals also need to have an easy access to your property. When you opt for a window cleaning Dormers Wells session, you'll be able to refresh the windows of any building at reasonable fees that remain unaffected by minimum contracts or undisclosed payments. See if you agree with our statement – stop by our handy price table below. With window cleaning in Dormers Wells, we can increase the appeal of your property even if it scrapes the clouds above. Let's see what you'll get once you book our adaptable service. For external window rinsing, the Dormers Wells window cleaners will utilise a telescopic water-fed rod. A water pump inside the cleaners' van will deliver filtrated water up the hose and out of a brush-head extension. The water, together with the brush-head, will erase any traces of dust from the windows of any four-storey domain. With rope access window cleaning, the specialists will use safe abseiling tools to reach even the uppermost floors in your commersial or residential property. We have all needed COSHH documentation and risk appraisal reports and can send them to you as soon as you need them. Moreover, we regularly check the washing gear to ensure that your session will go according to plan. And to scrub every interior corner of your glass surfaces, the proven team will use the regular sponge and ladder cleaning approach. 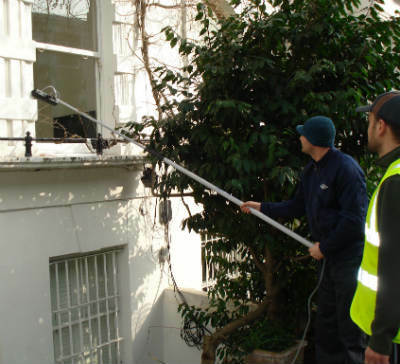 As our client base broadened, we widened our window cleaning in Dormers Wells to encompass other London areas as well. Please consult with our short list to see which close by locations we cover. Another quick and easy way to get a free instant quote or to book window cleaning services Dormers Wells UB1 is through our web site.